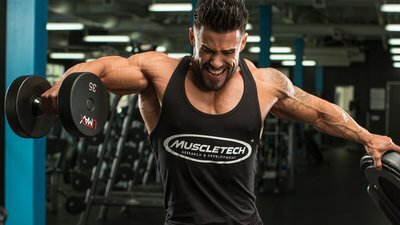 Modify Your Lateral Raises To Keep Your Shoulders Growing! If you perform every move the same way each workout, you're probably lulling your muscles to sleep rather than pushing them into growth. Here's how to spice up the same old lateral raise! Knowing how to perform a given move with perfect form is critical, and it will help you build a solid base of muscularity. But, once you get that base, it's important to explore the full range of subtle variations of classic movements. Learning—and practicing—all these variations will help you build thicker, denser muscles by training the target muscle at slightly different angles. Over time, incorporating all the variations into your workout will build more strength, size, and balance. The most obvious way to grow is by mastering barbell, dumbbell, cable, and machine moves. Most exercises can be done on every one of these implements; each provides a slightly different growth stimulus. With imagination, the options for exercise variations are limitless. Pro Tip: Besides working the muscle from slightly different angles, learning how to perform a particular move a number of ways can be helpful on days when the gym is crowded and lines form at the piece of equipment you need. Rather than wait in line, simply try an alternate move and your workout will stay on track and on pace.